Rock out zombies with ROCK OF THE DEAD today! Got the game yet? Drop a comment if you’ve had a chance to play it yet! It’s coming… and soon… ROCK OF THE DEAD, voiced by NPH and Felicia Day and written by me, is slated to launch October 19th! Killing zombies with your guitar controller has never been more fun, because, well, mostly because it’s never been done before. In honor of same, the Examiner did a write-up of yours truly here. If you’re using the right browser, you will only see half of my head! 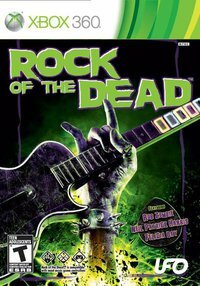 If you want to get ahead of the game, excusing the pun, you can preorder ROCK OF THE DEAD at Amazon (360 or PS3) or at Gamestop!